Tomorrow night, (Friday, July 13th, 7pm EST) Cruxy will host a one-of-a-kind event as Suzanne Vega returns to her avatar form for a special virtual listening party in Second Life. Vega will be celebrating the upcoming release of her new album BEAUTY & CRIME, out July 17 on Blue Note. I caught up with Jon Oakes to get the inside story. 🙂 What is Cruxy? Cruxy is a media platform that allows any digital content creator (mostly emerging filmmakers and musicians) to promote and sell their works. Here’s a simple example: You’ve shot a short film. You put it in Mp4 format and upload it to Cruxy. We create all of the thumbnails, previews and promotional widgets for you. You set a price of $1 for others to buy a download of the film. We handle taking the money from the buyers and delivering cash to you (less a small fee that we charge). Recently we’ve been more focused on helping creators get their work into virtual world environments like Second Life. We see that as the next phase and our main focus moving forward. What is the status of Cruxy as a startup, and who is team? We are two full timers with a coterie of supporters, contractors, advisors and well-wishers. We are financed by our personal savings accounts, some paying engagements, anxiety and sweat. Nathan Freitas and myself, Jon Oakes, have been working together for over eight years through three different (successful!) startups. We have built a ton of different technology, products, and solutions for people ranging from the government, to major corporations, and other technology businesses, but are most excited now to be applying our skills and inspiration towards creating new economic and marketing models for creative people, as well as the entertainment industry. Through Cruxy.com, we get to work with true indie talent and give them access to our entire platform. Working with a major artist and label such as Blue Note allows us to customize aspects of our platform, and create unique solutions, which also happen to help pay the bills. Its a good setup, and allows us to see the radical changes that are happening in this business from multiple standpoints. What’s some of the interesting technology behind Cruxy.com? As a startup, we need to be smart about how we spend our money so we use Amazon’s S3 and EC2 services for all of our server and data delivery needs. We pay on a variable basis (we did not have to go plunk down $25k for a bunch of servers and commit to a high monthly data service fee). This is really “on demand” computing and it allows us to scale in a pay that is precisely correlated ith our traffic and demand… rather than investing everything in infrastructure and hoping to fill up the pipe. We’ve built a pretty robust system for syndicating media content. We built our syndication system to use the XSPF format which gives us unlimited dynamic playlisting capabilities. We’ve also built a “virtual world widget” which allows people to distribute their music to their avatar in Second Life. They can then stream their music into their land or venue in Second Life so others can experience their music in a totally new and social way. Rather than just have a bunch of people anonymously visit a web page and listen to your stuff, with the virtual world widgets, you can hang out in your virtual environment in Second Life while a group of people check out and discuss your work. Besides Second Life, are there other places where creators can syndicate their media? Cruxy supports a variety of technologies that allow any media upload to our system to be republished and indexed by almost any standards-based service on the web. We’ve got flash widgets, RSS feeds, XSPF feeds, and even some microformats support. We also recently announced our deep integration with FaceBook so creators can get their work out to their FaceBook network more easily. We expect to launch this feature in August. Looking towards the future, we see the growth of gaming and virtual worlds as online social environments to be a huge opportunity for creative artists to gain exposure and income. We fully intend to extend the Cruxy platform into these types of spaces and economic models. What’s the story behind tomorrow’s Second Life event with Suzanne Vega? We have built a virtual lower east side “Ludlow Street” circa 1990 environment to promote Suzanne Vega’s new album “Beauty and Crime”, which is full of songs about various aspects of New York. Suzanne will join us (in avatar form) for a live interview and take questions from her fans. Avatars who attend will also be able to watch video of some of her recent live performances and sample her new album. Each attendee to the event will receive a Virtual World Widget that allows them to host their own listening parties and share the music with friends in their own land or club within Second Life. What makes this event with Suzanne Vega different from her first appearance in Second Life? We used the new Second Life voice beta software for this event. 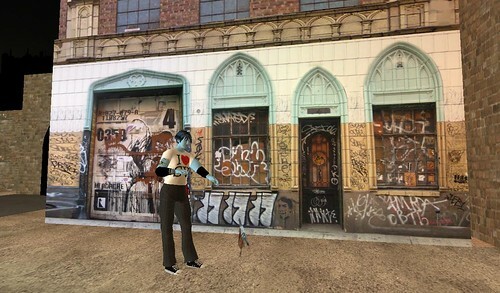 We also built the lower east side environment where avatars can come to hang out, drive taxi cabs, talk on pay phones and spray paint on walls long after the event. This event is about more than just the event… it’s about the environment where people can come whenever they want and sample the album while experiencing the New York that so inspires the album. We’ve got graffiti by Zephyr, the prolific graffiti artist of that era and guitars by Robbie Dingo, the renowwnded Second Life designer, at a LES guitar shop. One other thing to note is that the MTV virtual lower east side is designed for the 18 to 25 crowd that might not remember New York pre-Guiliani. We wanted to recreate more of the grunge aesthetic that we so enjoyed in our 20’s in NYC. How big is the market for what you are doing? Breakdancers and indie musicians don’t really make much money, right? What everyone is realizing is that there is a growing appetite for independently created media content. Jonathan Oakes founded and managed his first start-up, a systems integration consultancy, at 24 years old. In 1998 Oakes co-founded ThinAirApps, where he served as CEO and Chairman leading the company to a successful acquisition by Palm Inc. in 2001. Oakes spent over two years at Palm, as Senior Director managing corporate and product strategy. Oakes earned a BA in American Studies from Skidmore College and an MBA from Harvard Business School. Over the last ten years, Nathan Freitas’ career has spanned the academic, corporate, and non-profit worlds, solving difficult problems through the thoughtful application of technology. His work has been built into Palm handhelds, on display at JavaONE and SIGGRAPH, included in Wikipedia, and covered in media ranging from Boing Boing and Slashdot, to the New York Times and Howard Rheingold’s book “Smart Mobs”. He also plays a mean double bass.